Yarmukian deposits have not been encountered in either the North or East Field excavations, but ca. 1500 m2 have been investigated in the Central and South Fields. Despite the extensive excavation, only a few figurines have been recovered from 'AinGhazal, including seven human and five identifiable animal specimens (one each goat, sheep, and cattle, and two birds) plus a dozen or more unidentifiable fragments. One of the human forms is atypical "coffee bean" fertility specimen (Garfinkel 1995: Plate 10; cf. Perrot 1966:Pl. 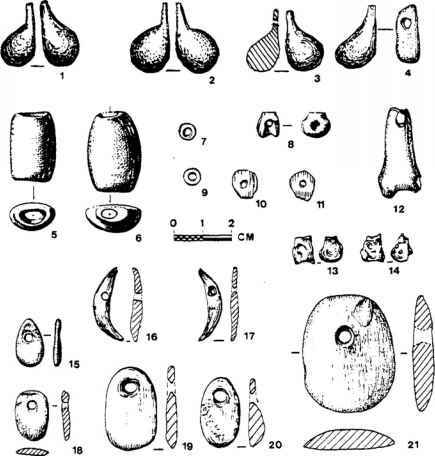 VI-13, 16-17), and another is a highly stylized, scratched limestone pebble (cf. Stekelis 1950-51:Pl. 2a-b). Superficially, the small number of figurines suggests a minor ritual role continued from the PPNC phase, although it should be stressed that by the beginning of the mid-eighth millennium, the population ofYarmukian 'Ain Ghazal had fallen to its lowest level since the founding of the village some 2,000 years earlier. It is possible that the number of figurines per household was actually not very different from the MPPNB. The contrasts of burial patterns in the earlier periods with the Yarmukian could not be stronger: not a single Yarmukian burial has been found. Presumably a Yarmukian cemetery has gone undetected by our excavations and test trenches on and off the site.